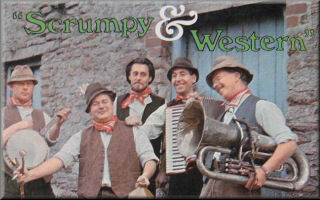 Bear in mind this is a specialist music genre website, and we only list gigs and news from Scrumpy & Western artists! They are nothing to do with this website, and have their own website at www.mag4livemusic.co.uk. any of the other Scrumpy & Western bands or artists listed here. If you want to book The Wurzels, check the official Wurzels website or call the band's manager Sil Wilcox on 01373 834167. If you want to contact any of the other bands or artists listed on this website, please use the links on their respective pages. If there is no contact information, then we won't know how to get in touch with them either (you can always try a specific web/social media search)! In accordance with copyright law, the originators of the Scrumpy & Western website automatically hold the copyright of all original material contained within these pages. If you wish to make use of it, please contact me and let us know - in most cases there will be no objection. Non-original material: Permission has been obtained from the copyright holders for the use of some of the images, lyrics, sound clips and text used or quoted in the Scrumpy & Western website and its associated websites. The remainder are used without explicit permission having been obtained. The information within the Scrumpy & Western pages is intended to be used only for purposes of private study, scholarship or research, in accordance with the legal principle of fair use. The items used do not carry individual copyright notices, and the absence of these must not be taken to imply that items are free from copyright restrictions - anyone copying these for other uses will be in violation of copyright laws. If you own the copyright of any item included in these pages and would like an acknowledgement to be added, please contact us and we will gladly do so; if on the other hand you object to its inclusion, please let us know and we will remove it. It is hoped that copyright holders will regard this use of their work favourably, as it should serve to publicise their material, ultimately for their benefit. There are links to various other pages from these. We assume the owners of those pages are happy for us to include links to their pages - if any such owner is not please contact us and we'll remove the link. Better still, let us know you're happy for us to include the link! The Scrumpy & Western Page includes links to other pages believing them to be of interest to readers of these pages. Every effort has been made to ensure that the pages linked to do not contain material which may offend readers. However, because of the Internet's dynamic nature, the owner of the Scrumpy & Western website does not accept any responsibility for the content of other pages which are completely outside his control. This caveat applies to any page to which links are given, either directly, or indirectly via other pages. Disclaimer*: The producer of this page has no commercial interest in: any of the recording artists mentioned in these pages (except one! ); any of their management, agencies, record companies, music publishers, etc. ; any scrumpy producer; any other business which may be mentioned. The pages are read at the reader's own risk, and no responsibility is accepted by the owner of these pages for any injury or insanity caused by listening to Scrumpy & Western music or drinking cider, nor for any other misfortune which may befall the reader.